My mother wore many hats both literally and figuratively. Most of her head coverings were prayer veilings worn every day. As a young woman, her coverings were large, decreasing in size as she got older and church rules had progressively relaxed. 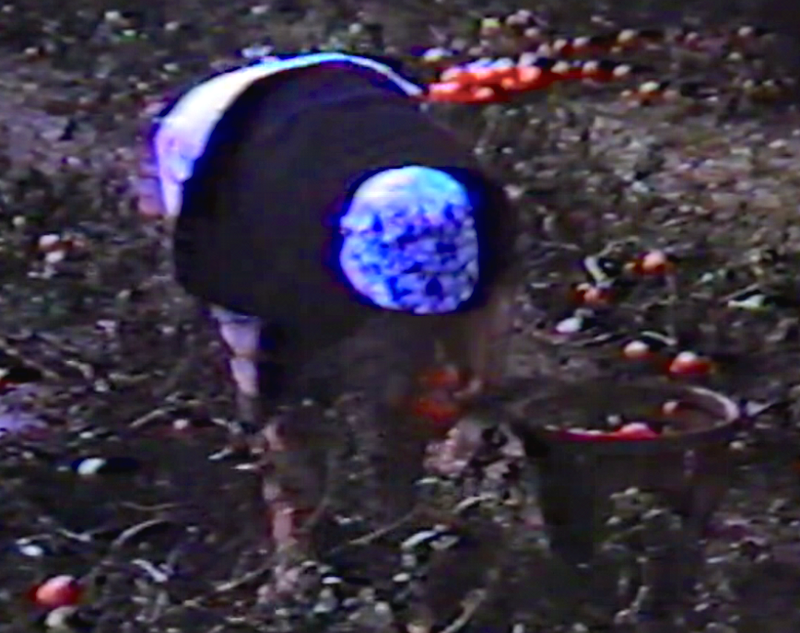 Mother wore a sunbonnet in the tomato patch in Bainbridge, PA. As far as I could tell, Mennonite women in the 1940s and 1950s, paid no attention to Coppertone ads. (Remember billboards with that sneaky cocker spaniel pulling on a little girl’s swimsuit bottom, exposing her pale cheeks?) No one that I knew then wore sun tan lotion regularly, except maybe to the shore at Atlantic City or Ocean City. Country women, including my mother, wore bonnets in the garden and fields to protect their skin. The details are fuzzy here because this photo is another movie “still” captured from Aunt Ruthie’s 16 mm camera (circa 1955). I’m looking at a film clip of Mother in rows of the tomato patch just now, humped-over body bending toward a flush tomato bush facing the camera, her blue and white speckled sunbonnet sewn with three tiers of matching ruffles, a row along the bill, a row at the crease, another row near the crown of the hat—come to think of it now, headgear much fancier than her everyday prayer cap. 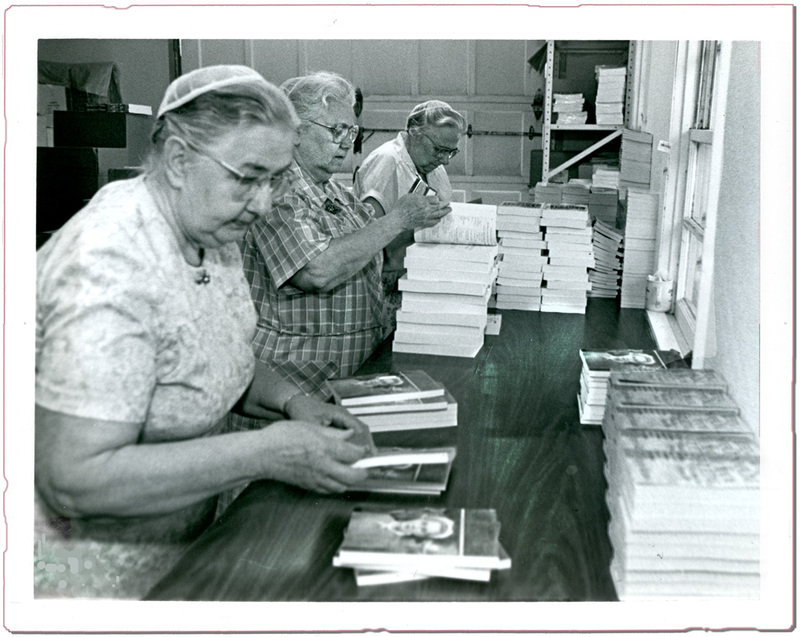 Mother particularly enjoyed her last volunteer job, stamping the Choice Books logo onto inspirational books for display on kiosks in stores around the country. During her “morning away,” she got to see her niece Dotty Metzler Martin often, met her friend Bertha, and ate lunch with other friends. She always sounded thrilled to describe this excursion when we talked on the phone Saturday mornings. If someone asked Mother, “What lights your fire?” She would probably answer, “Serving others,” a motto she lived by. 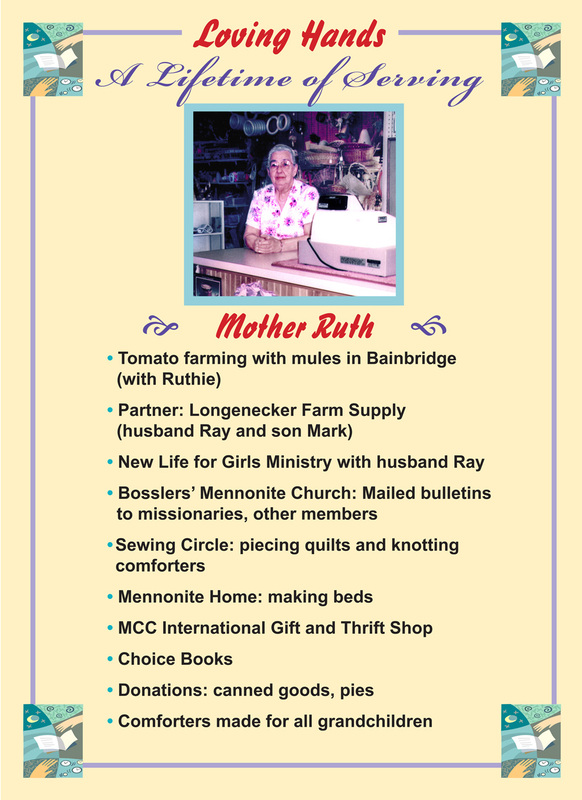 The 16 x 22 inch poster created for her 90th birthday party and later, displayed on an easel at her memorial service, shows flash points of service, including her stint at Choice Books. How would you answer these burning questions? What burns “hot” within you? Hearing from you lights my fire. Thank you for commenting here! Previous postAny Hats in Your History? I love the photo of your mother holding you as a baby. Now that I’ve met you, I see how you resemble her in this photo. It’s funny that her sunbonnet was “fancy” with ruffles! I wondered what tomato farming with mules was–did mules helped pull carts? I was too young to remember any thing other than a tractor pulling the tomato planter, but apparently Daddy hitched up two mules for the job. It’s a pioneer image I carry in my mind now since the day Mother told me about it. Yes, you are “thinking in poetry all the time” as you mention on Joan’s website. And you are right: It’s in the genes. You come from a long line of creative folk. And you are also disciplined. Rising every morning to write and appear here first in line. I never take you for granted, Merril. You are so sweet, Marian. Thanks. I understand that “pioneer image” as you explain it, especially since you were too young to remember it. There was just so much useful and informative insight. Being part of this wonderful caring community makes me feel extremely happy. Thanks for such a great post, what a life! Take care Cally. Welcome here, Cally. I just checked your website and enjoyed the subtitle to your “special people” emphasis: Remember to see beyond today. Thanks for the reminder, great advice for anyone. Your love for your mother and the fact that you miss her shines through like fire in this post and so many others. What a strong foundation she gave you! What lights my fire? Love in all its many forms. Feeling it flow through me to others, to the beautiful world around me. Yes, Mother and others gave me a strong foundation. It’s obvious I miss her presence now more acutely as we are coming up on the second anniversary of her death. I smiled reading about the neighbor with the bikini. We had some fancy neighbors too. Yes, I see a strong beam of light and love flowing through your posts these days. You have a perspective and voice that reaches back in time but also focuses on embracing what’s ahead. I am quite sure your mother and mine traveled together. Their Mennonite frugality would say “Why take two cars to the same place. Why, we could go together!” Yes, they were like sisters. I like the thought that they were constant friends as they grew older. Thank you for describing your ministry here. The idea of a multicultural church sounds like a foretaste of heaven where all tribes and nations will worship together. I always appreciate your reading and commenting here – another Longenecker heard from – ha! Salute to another Choice Books volunteer; the national office used to be headquartered here at my office (where Herald Press now holds forth). It’s cool that she could tolerate that much standing even in her 90s (if I read correctly). Books and writing are pretty much what light my fire these days! I have a sun bonnet similar to the one you show; and it had ruffles all around the visor type section. I will have to write about that someday too. I have my grandmother’s pattern for them. Grandmother made bonnets and coverings for folks near her home in Indiana, but she was never Amish. Thanks for shedding light on Choice Books history here, formally headquartered in Harrisonburg, a fact I did not know. Mother drove to Salunga, PA to stamp books at this distribution point. No grass grows under your feet, Melodie. You write for many venues, perfect recipes in your kitchen, and keep up with grandchildren too – what a rich life. Thank you for the anecdote about the sunbonnet. Hang on to that vintage pattern. I believe that my passion and fire to serve came from the example from my mom Longenecker. She never talked nor boasted of what she did. She just lived what she did and loved doing it. Unspoken acts are greater than words. How I miss her and wish you could call her and tell her of my adventures craziness and ask for advice when I find myself at a point of helplessness. She would patiently listen and would say God never gives us more than we can handle. Be still and wait on God this to shall pass. So when you find myself in this place I pray and remind God that I know he never gives me more than I can handle and that this too shall pass. Thank you for the pictures. Yes you look so much like mom. I have a feeling Mom knows all about the good things you are accomplishing. Your wisdom for the task comes from the same Source she relied upon then. Both she, and my dad, loved you and your family. I hope your new venture is going well. I just love remembering my grandma. She was such an amazing person. She also wore the missionary hat and helped young woman. I was shocked after reading the guest book. So many girls lives were touched by her kind heart welcoming arms. Yes, New Life for Girls was a great outreach for her your Grandpa after we left home. (You may have read the comment from Gloria above, one of the names in the guest book.) Thank you for speaking at her memorial service and for your many visits to PA, especially during the last years of her life. Your mother certainly seemed to be a selfless person from all your writings here Marian. I think what lights my fire is determination for justice. Nothing gets me going like injustice. Shirley referred to the crazy notion of iodine and suntan lotion in the comment above. Yes, the ozone layer has been compromised far more since then. Living in Florida I always wear a moisturizer with a good SPF rating. I’m glad you liked the reference. 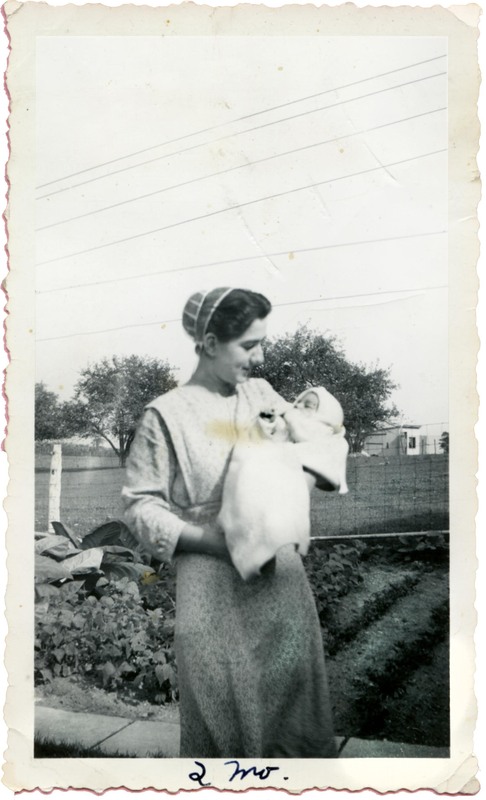 Mom didn’t worry about the sun; she just put a sunbonnet on it! I agree with your stand against injustice. Readers can certainly feel your advocacy for right in your posts, especially as your fight for good healthcare for your husband. Hope things are going better for you both. Good question: Travelling is the thing that motivates me the most, which in turn inspires me to learn different languages. I admire you as a globe-traveler and lifelong learner, especially your inspiration to learn different languages. Talk about full immersion. Wonderful, Fatima! Marian — The photograph of your mom holding you at 2 months of age is beautiful. You bear a strong resemblance to your beautiful mother. You agree with others that I look a lot like Mother. I’ll take that as a compliment. You have made a positive difference in my life, ever challenging me and others to be our best selves. I have repeated to others the slogan posted loud and clear on your website banner; Whatever you are not changing you are choosing. Powerful truth! The first picture is such a keepsake, Marian. It’s also the Cliff’s Notes version of all the wonderful roles your mother had and the difference she made in your life…and many others. Beautiful. What an image: “the Cliff’s Notes version of all the wonderful roles your mother had and the difference she made in your life.” I’ll always associate that beautiful metaphor with you, Marylin. You can say the same about your own mother’s influence I’m sure. Thank you! Your mother is an amazing person! Yes, she is, Fiona – someone to emulate! I come up with serving others, protecting the environment, writing, and creating beauty. Also my children and keeping alive my heart connection to Vic. Sometimes writing is first on the list but in times of need, serving others goes first. You are your mother’s daughter–a huge complement to you, Marian. Thank you for sharing your heart. Your assorted threads are similar to mine and all of them appear to be matters of the heart, even the environment. The connections here, yours high among them, inspire my writing as they assuage my grief. I love the poster with your mother’s many roles! My grandma also talked about raising tomatoes. Evidently a tomato cannery was operating nearby and wanted tomatoes. She said that they planted several acres on the hill. Matter of factly she also said, “I never worked so hand in my life!” My Grandma was not one to complain. I’m reminded how our fires are kindled by the encouragement of mothers, grandmothers and friends in our lives. Both of my grandmothers wrote to me regularly during my formative college years. That support was invaluable to me. The rich vocabulary with which they described the world and the values they lived out were precious gifts that I treasure. What lights my fire would also have to be service. Being able to use God given and woman developed talents to serve others! From potholders to power point presentations…using everything in your life for good! Thanks Marian for your very inspiring blog! And this thought-provoking post. Potholders to power point presentations sounds like your interests flow from culinary to teacherly. I hope you can share some of your Grandmothers’ letters, perhaps through your association with Joanne Siegrist and others in the Mennonite community. Thank you for commenting here again, Ann. I am enjoying getting to know someone else who is familiar with the landmarks I grew up with. Enjoying our connection too! Loved reading your Grandma’s letter. Until the re-read years later, I didn’t realize how emphatic she was about Kitsa’s visit. You may find similar reactions to the letters you read again from your grandmothers. Kay, I’m so happy to see you here – welcome! I remember your beautiful violin solo at our daughter’s wedding and your devotion to your “Fayette Fiddler” students. You have been playing and teaching for decades now. The violin is obviously your passion and so are your students who share it. Thanks for stopping by with a comment. I’m glad we have a connection here. Springtime 🌷🌷🌷 It’s springtime that lights my fire . Last Saturday I scurried off to a local town , that normally I love , but I’d just got over a cold and was a bit on the grumpy side ,even though it was a glorious day . So I got back in my car and suddenly my spirit took over . well belive it or belive it not that’s how it felt , and it led me to a local National Trust house, a bit like Downton without the frills😊 . The house did not appeal , even though on a normal day I’d have jumped at the prospect of visiting it…it was the wood adjacent to it . The wood was filled with bluebells and other spring flowers. Birdsong filled the air and the gurgle of the river mesmerised me …that’s what lights my fire Marian . What a storyteller you are and so clever in creating a mood. I think we would have had a lot of fun cavorting around in Grandma’s woods if we were girls there together. Bluebells sound wonderful. Did you see the photo I posted of you with the bridesmaid hat on my Facebook page? It got lots of LIKES! Thank you, Cherry! The post of you on Facebook is dated April 15 and there were were 15 Likes – yay! When you scroll down, you can see it, I hope. The last post I got was 14th April for some reason …never mind 15 likes -brilliant! Maybe re-start your computer? Refresh Facebook? Whenever I’m in doubt, I ask somebody under 20 years of age – ha! What a lovely tribute to your mother, Marian. I loved seeing all of the photos and the poster is wonderful. What lights my fire is making people smile. What burns “hot” within me is the desire to live a life that honors God. Cliff, my resident artist, made the poster. He also designed a similar one for my Aunt Ruthie, not posted here. I’m glad you enjoyed the photos and took the time to remark here. Thank you! Your light burns brightly in your life. I am thrilled to see your beacon expanding. Soli Deo gloria! My grandmother didn’t wear a hat. She wore her hair in a big bun gathered at the back of her neck and she pushed a black comb beside it whenever she went out. I remember the Easter bonnets we wore to church when we were in our early teens. They were ordered from the Eatons catalogue and they made us feel so special. Reading good poetry lights my fire. The German Classicals and Romantics are especially good as are that group of English poets with George Herbert. There’s also Manley Hopkins and so many others. I also love to read to my grandchildren and pray with them before they go to bed as I just finished doing. One of my favorite English poets, George Herbert, is famous for his praise of “God’s Grandeur.” A lesser known work “That Nature Is a Heraclitean Fire . . . “ communicates the comfort of the Resurrection, appropriate during this time of year. I heard the Dean of Westminster Cathedral, London, recite this powerful poem in a service before my week in Oxford. This may be one of his poems you have enjoyed too. I admire your reading to and praying with your grandchildren. We do that too especially when they have sleepovers. Deuteronomy 6: 5-7 is as relevant today as it ever was. Thanks for your thoughtful “hat” anecdote too, Elfrieda. Its wonderful you have so many photographs and film to remember her by. There are very few of my mother but she burns bright in my memory. “She burns bright” in your memory is a lovely thought, brighter than photos that eventually fade. Glad you have some though. You got you photo-loving gene from somewhere – ha!